The Magic City Rollers of Billings, Mont. recently did something amazing. So amazing, you have to wonder at the possibilities of it happening again—and happening for real. Lisa Graham, a local resident and life-long roller derby fan, was recently diagnosed with the lung disease pulmonary fibrosis. Unfortunately, it’s advanced to the point where she, with treatment, has only a few more years to live. Not cool! However, once the derby community caught wind of this, Very Cool Things started happening. Derby Central has the full story, but the long and short of it is that Graham got to fulfill a life-long goal: Play roller derby. Lisa “Hotwheel$” Graham makes her roller derby debut—from a wheelchair. Graham’s condition forced her to remain bound to a wheelchair, but that wasn’t going to stop “Hotwheel$” from lacing up her skates and hitting the track as a jammer. In the demo jam before the game began, Graham, her wheelchair, and her jammer-pusher teammate broke through the pack, earned lead jammer status, and scored 4 points before calling it off. Woooooo! Stuff like this makes you appreciate what the roller derby community can do when everyone comes together. Not only did it help someone in need to tick off an item from her bucket list, it also raised some money for charity during the game. It’s a win-win-win for everyone! A goofy, one-off thing like this can also spark an idea. Getting one person in a wheelchair to “play” roller derby is amazing. Wouldn’t it be amazinger to open up an opportunity to allow everyone bound to a wheelchair to be able to play roller derby—for real? 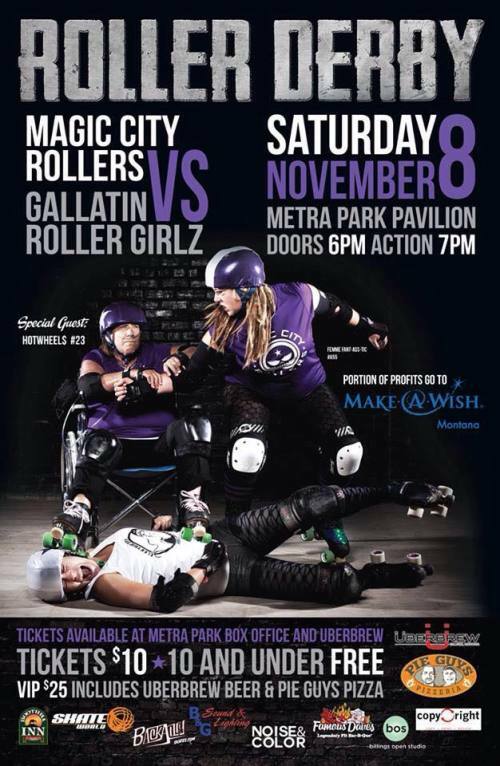 Why not roller derby, too? Just because derby is a contact sport doesn’t mean wheelchair users can’t play it in the same way that we do. Although, using standard wheelchairs, even with normal safety equipment, is probably not a good idea. Most wheelchair sports use specialized chairs, and a potential wheelchair derby would be no different. A chair equipped to handle high speeds and big impacts would be required. Happily, such a chair is already used in a sport: Wheelchair rugby. Played indoors on hard surfaces, wheelchair rugby1 features two teams of four players playing a game that is a cross between basketball and rugby. Players carry a volleyball in their laps and may pass the ball to teammates. A team scores when a member carrying the ball rolls into a goal area at the end of the court. Players may also attempt to dislodge the ball from their opponents’ possession. As in regular rugby, these attempts can be made forcefully. Very forcefully. The “head-on car crash” kind of forcefully. Wheelchairs made for rugby, with their leg cages, front bumpers, deflector wings, and toed-out wheels for agile handling, seem like they’d be perfect for wheelchair derby, too. Just add some head protection, and we’d be good to go. With the mode of transport squared away, let’s turn to the field of play. After the WFTDA created the standardized flat track, any 108-foot x 75-foot surface could turn into a place to play roller derby. The simplicity and accessibility of the track is a significant reason why the game has seen explosive growth worldwide. Just tape or chalk down the lines, then skate. This presents a potential problem for wheelchair derby. Many wheelchair sports use the exact same court/floor/field dimensions and the non-wheelchair versions. Wheelchair basketball, for instance, doesn’t make the court bigger or lower the hoop to accommodate the wider footprint and lower base from which wheelchair players work from. Nor would it need to; there is plenty of open space out there to work with. The same cannot be said for a roller derby track. Putting 10 wheelchairs in a space that is 15 feet wide at best is a recipe for gridlock. As few as two chairs could defensively plug up the track effectively enough to make legal passing next to impossible, even with teammate assistance. There is plenty of room to skate or wiggle through 10 upright skaters and stay in-bounds. Not so much for 10 players sitting in wheelchairs. Reducing the standard number of players on the track, such as to 4-on-4 or 3-on-3, might open back up some space and alleviate this problem. But it could also mess up the essence of the offense-and-defense aspect of the game, which works best with 5-a-side. If we’re going to make wheelchair derby become a reality, it would be most helpful if it could be played both 5-on-5 and on the exact same track as used by WFTDA and USARS wheel-foot derby players. Using the same track would be very important, since it would allow wheelchair players access to existing facilities. There is a way to fit in all of those wheelchairs without making things hopelessly clogged: Make the track wider, without making the track wider. In sports, lines on the field of play serve multiple roles. Start lines, finish lines, boundary lines, restrictive lines, technical lines, you name it. On a standardized flat track, you have a lot of different lines: Jammer line, pivot line, a line of no return for the penalty box, the lines demarcating the bench area, etc. Of interest here are the boundary lines on the inside and outside of the track. The majority of roller derby rule sets specify that a skating player is only in-bounds if their skates are entirely in-bounds, and that the lines are a part of the in-bounds surface. This means that a player is out-of-bounds if 0.01% of his or her skate wheel is touching beyond the line, even if 99.99% of it is in-bounds. Being instantly out-of-bounds by touching out-of-bounds is not a universal constant in sports. Different sports have different rules about boundary lines. In soccer, for example, 99.99% of the ball and 100% of the player can be out-of-bounds; as long as 0.01% of the ball is in-bounds, it’s still in play. Only when a ball goes completely over the line and fully into touch does play need to stop for a throw-in. @fathertrucker Not really. Tweak rules so a player is in-bounds as long as a chair wheel is touching in. Instantly makes track 6ft wider. The physical track is the same size (dashed lines), but by changing the definition of “out of bounds,” the field of play has been widened. Perfect for wider, boxier wheelchairs! Letting players continue rolling, blocking, and jamming while wheels are outside of the standard track boundary adds a few feet of legal playing surface, effectively making the track 20 feet wide without physically making it larger. Until a wheelchair is completely pushed out and over the line, the player sitting in it will be considered in play. 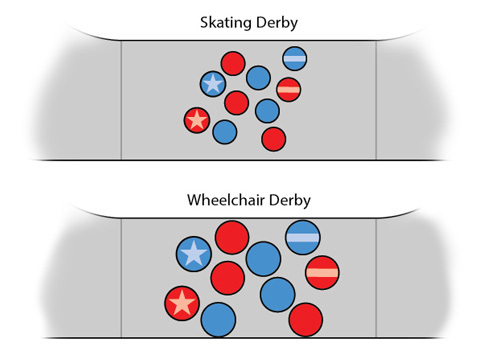 On paper, this seems as if it would keep the flow of wheelchair derby consistent with regular roller derby. Defenses could still set up walls, but in such a way where blockers could still punch holes or seal off walls to allow room to pull a jammer through. (If it’s still too plugged up for 5-on-5 play, then perhaps this wider track configuration would be better for 4-on-4 instead.) Individual blockers could still guard (the inside of) the inside line, forcing players to take the long way around until help arrives. However, it’s impossible to say how this would work for sure unless we can get some wheelchairs and some handi-capable athletes on a roller derby track and test this out. Naturally, testing would also be required to see how much of the current WFTDA or other rules would suit wheelchair play, and how much more of it would need to be modified.3 Legal contact zones would need to be redrawn. Referees probably won’t need to be on roller skates anymore. Just to think of a few. There’s no telling if this idea would even work. Then again, some people may have thought that a terminally ill, wheelchair-bound woman from Billings, Mont. would have never seen her roller derby dream come true, if even for a few minutes. There are already derby-ready wheelchairs and potentially right-size wheelchair derby tracks. All that’s needed are a few pioneering souls to strap in and bash circles around each other. It may be hopeless fun, but it may also be the second step to expanding roller derby to where it has never been before. Wouldn’t it be amazing if it turned out that Lisa Graham took the first one? I’ve seen this wheelchair derby advocated by GGRD a few years ago but it didn’t pan out for some reason. Which is also known as quad(riplegic) rugby and murderball. Yes: Murderball—the name of the game, and the name of a must-see documentary about the sport. There are currently two variations of roller derby that already abide by this principle: No holds barred Renegade roller derby, and the physicality/insanity that is Roller Game Japan. Humorous example: How can you stand up when there are 10 seconds remaining in your penalty? You’re in a wheelchair!